Every once in a while, a film comes along that transcends its trappings and finds a broader than expected audience, only to become a renowned classic. Star Wars was such a film – a silly space opera that managed to become one of the biggest and most influential films of all time. Without it, we would likely have not had the revival of Star Trek and the creation of Alien. The Dark Knight did the same for superhero films, as well, taking its subject seriously and forever changing the expectations regarding the quality of a subgenre that was still considered to be mostly a catalyst for special effects. Clueless is one of those films – a high school comedy that manages to be both smart and likeable enough that it was a hit with both audiences of all ages as well as becoming a darling with critics who recognized it for its witty dialogue and well developed characters. It was enough of a hit that it even became a well-received TV series. Teen comedies featuring a blonde rich girl protagonist are bound to either make fun of its main character for being a dimwit or, even worse, treat her like a princess who goes on a sort of fun, supposedly meaningful high school experience that will apparently change her life forever. Clueless remains a refreshingly down-to-earth in its scope, despite the characters’ social status. Taking inspiration from the Jane Austen novel Emma (the first book I never completed in high school out of sheer distaste for the writing style), Clueless updates the story of the spoiled rich girl into the mid-90s and places it in Beverly Hills. The new protagonist and narrator, Cher (named after the singer, of course), is a well-meaning but somewhat deluded daughter of a high priced attorney. Cher was born into a sheltered life of luxury and riches and, as such, mistakenly believes her lifestyle to be the default, and anyone who hasn’t achieved at least the same social status as her is just one makeover away from popularity and happiness. Aside from trading catty remarks with her fashion rival, Amber, however, Cher is mostly altruistic in her intents to educate the world in proper fashion and teenage etiquette. Basically, Cher is both naïve and yet intelligent enough to turn the art of being a popular girl into a life philosophy, and together with her best friend, Dionne (also after the singer), she sees herself as sort of an ambassador to those who don’t know any better. While Cher’s journey and the characters that populate it is entertaining enough, the main highlight of the film is in the wit and delivery of director/writer Amy Heckerling’s hilarious script. You can’t help but enjoy the clever mix of a relatively strong vocabulary being delivered by a philosophical valley girl, even when the jokes are old hat. “I felt impotent and out of control. Which I really, really hate. I had to find sanctuary in a place where I could gather my thoughts and regain my strength…” [Cue a cut to the mall.] It’s the delivery that counts, and it also helps that the film has an affection for the characters that recognizes that they don’t always know what they’re saying or doing, even if the characters think they do. Even the increasingly selfish Tai and Cher’s rival, Amber, are never denigrated into becoming full on antagonists thanks to Heckerling’s refusal to treat them as anything more than what they are: clueless, but not hopelessly so. It also helps that Alicia Silverstone’s performance here remains the best she’s ever given, at least from what I have seen from her (which is admittedly limited to this, Blast from the Past, Batman & Robin, and Butter). 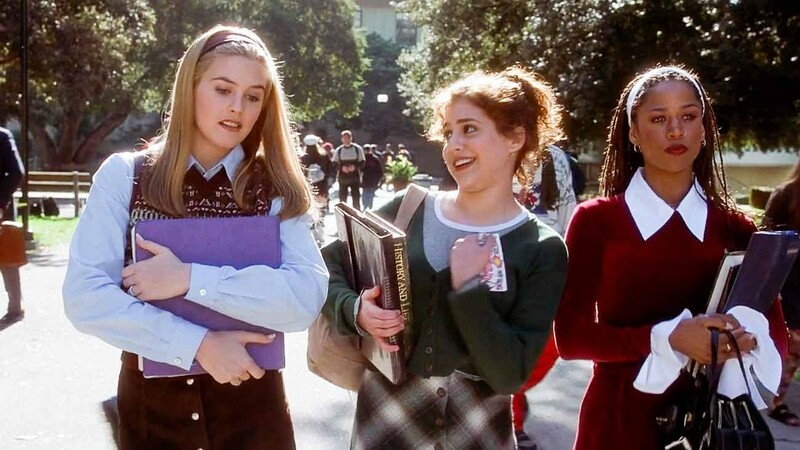 Without the right actress in the lead role, Clueless could have been disastrous, and Silverstone’s portrayal is endearing, even when Cher is whining with that aggravating squeal of hers or being a bit of a dimwit, as in her class presentations, which truly deserve to be heard rather than read to appreciate the true genius behind them. Supporting cast members hold up their side of the bargain, too, with Brittany Murphy bringing her bubbly, sassy presence as Tai and Paul Rudd, even at this point in his career, being charming as ever as Josh, Cher’s older, college-aged stepbrother from one of her father’s previous marriages and with whom she frequently butts heads. The following grade I’m going to assign Clueless comes not from comparing it to the classic works of Francis Ford Coppola or Martin Scorsese. It’s entirely based on how well the film stands on its own merits. Clueless is incredibly well made entertainment – endlessly amusing, cleverly scripted, undeniably endearing, and exceptionally performed by its cast. Along with Mean Girls and Legally Blonde, it also stands as the best in what I consider my “Girly Movie Trinity.” If I had to put myself to the task of listing my top 10 favorite comedies (a hard task indeed), I’d be hard pressed not to include Clueless on that list. (Maybe not one of the best comedies, but still one of my favorites.) How could you not just unconditionally love a film where a character protests censorship by stating, “Until mankind is peaceful enough not to have violence on the news, there’s no point in taking it out of shows that need it for entertainment value”? Yeah, this movie is pure gold. Instead, the Chargers were GIVEN the first down and scored on the subsequent play. positive vibes out into the world.